This basin was situated just south of Murray's Bridge and Samuel Ashton of nearby Woodley Mill owned the surrounding land. Moreover, he was the occupier of Far Coal Pit Field adjoining the basin. The map does not show any pit buildings or a shaft but there would have been a shaft somewhere in the vicinity. Coal from here would have been transported by boat the short distance southwards to Ashton's Private Branch where it would have been used to power Woodley Mill. This was situated a short distance from North Woodley Basin and the land surrounding the basin was both owned and occupied by Samuel Ashton of Woodley Mill. The map shows pit buildings adjacent to the basin but it does not show the shaft. 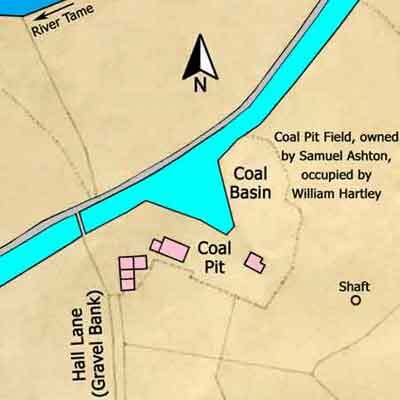 The shaft in Coal Pit Field was probably a ventilation shaft. 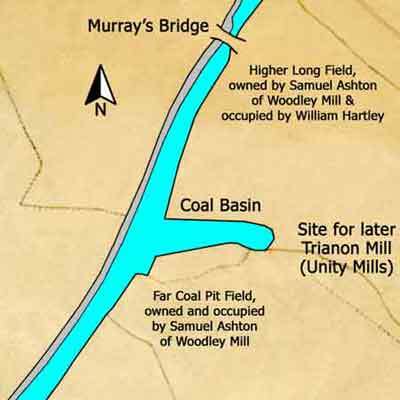 Similarly, coal from here would have been transported by boat to Ashton's Private Branch to power Woodley Mill. The Ashton family also owned Apethorn Mill (later Gee Cross Mill) and Throstle Bank Mill, both alongside the Lower Peak Forest Canal, and it is possible that coal from both basins was transported to them by canal. Following the death of their father, Thomas Ashton Sr, in 1845 the brothers Thomas Ashton Jr and Samuel Ashton owned mills in Hyde and Woodley, the firm being known as Ashton Brothers & Company.